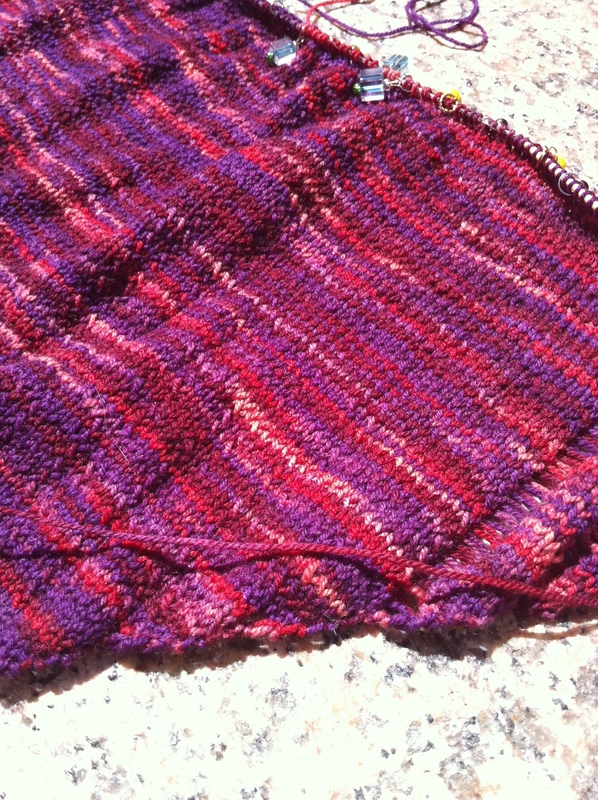 I am starting a Knit-A-Long for the fun and easy Clapotis shawl / scarf starting on May 1st! It seems the entire planet has already made a Clapotis, but if you are a rebel holdout like me or just want to knit another one please join us. Please share this invitation to your yarny friends, we already have three members! The pretty Clapotis pattern is here. I started one last year but had to frog it, the skeins were flash-dyed and didn’t match! My new yummy yarn for this Knit-A-Long is the color of buttery sunshine and sparkly with real silver thread spun inside! I have never wanted Spring to show her sunny face more. Posted in knitting and tagged Clapotis, KAL, knit-a-long, knitting, Knitty, scarf, shawl. Bookmark the permalink. 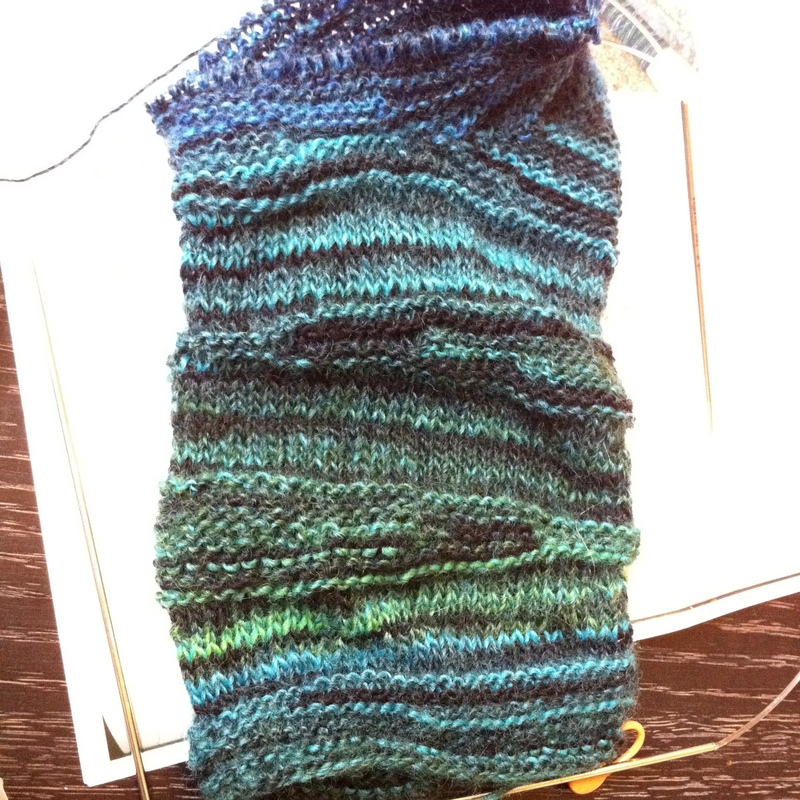 I started a new sock using the Knit Sock Love book mOm gave me two Christmases ago. The Wedge patten looked like so much fun and I breezed through sock #1. All was going so well! So well, that is, until I messed up grafting the short row toe onto the foot. What should have been the easiest step resulted in my having to spend two days ripping out the graft, putting this non-plied yarn back on the needles, on size 0 needles (!!) and laboriously unknitting back the toe and who knows how much of the foot. Lord Kitchener, I hate you sometimes*. I love this yarn but not to to tink it (knit = knit backwards). This yarn is like knitting with roving, it is sticky and grabs onto the next stitch with a bulldog tenacity and it’s hard to put the stitch on the needle cleanly. When I was ripping out the blasted graft quite a few of the wrapped stitches got messed up, so the only thing to do is go backwards until I have a nice clean row, and then do it over correctly. So, my second night in a row, I’m sitting Indian style on the floor by a lamp, tink tink tink! It’s going to be a beautiful pair of socks though! I am trying to feel zen and embody patience. Doing this is much easier than coordinating the move of my office in under two weeks!! I may not be able to lift more than 5 pounds but I can do this and it helps clear my mind. 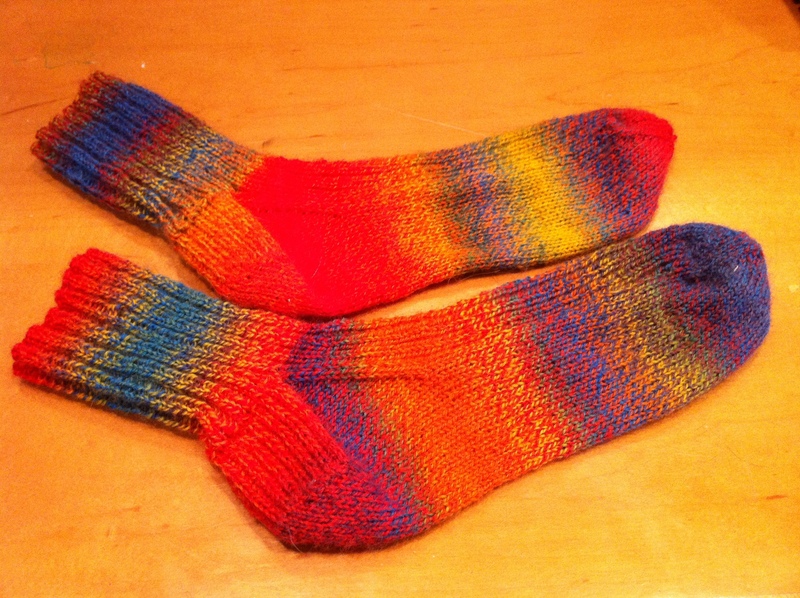 Last night I finished my Crazy Winter Socks using the fabulous Crazy Zauberbol. Wish I hadn’t listened to the sales lady when she warned me not to make a very long leg because the yardage on the ball wasn’t very generous. I made a 4.5” leg and size 9 foot and have TONS of yarn left over. I am considering picking up stitches from the leg and knitting them a bit longer, but it seems like so much *work* so maybe I’ll just give up. They feel great on though, despite looking like crazy winter anklets. They sure do banish the winter blahs though! Posted in knitting, Uncategorized. Bookmark the permalink.